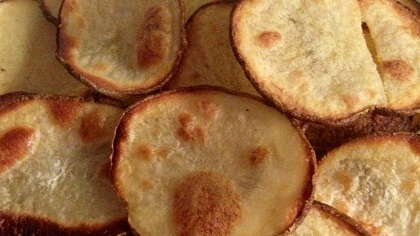 Try this recipe for a healthy alternative to potato chips! You won't be able to make these fast enough! With just 3 simple ingredients, here's a healthy snack or side dish that won't last long. Preheat oven to 300 - 350 degrees. Carefully cut potatoes into thin rounds using a veggie mandolin. Spread a single layer of potato rounds onto a baking sheet lined with parchment paper. Spray potatoes with olive oil spray and sprinkle with salt. Turn potatoes over and repeat. Place potatoes in heated oven for approximately 15-20 minutes until potatoes begin to dry and crisp. Using tongs, turn potatoes over to crisp and brown the second side. Eat right away! Too good to be true! !